Back in 1820 or thereabouts there were two wee English brothers, born in Wales, by the names of John Hay Allen and Charles Hay Allen who moved to Moray, Scotland. They changed the spelling of their name to Allan, to make it look a more Scottish spelling, but then shortened it to Hay. These two brothers are one of the reasons our tartan industry is here today. We first hear about them, presumably after Sir Walter Scotts big tartan spectacle for King George IV, in 1822. It possibly gave them the ‘cunning plan’. They started to let it be known, subtly, that they were the grandsons of Prince Charles Edward Stewart and that they just happen to have a manuscript from 1571 that showed all of the major clan tartans. It had been given to Bonnie Prince Charlie at the Scots College of Douay. Sir Walter Scott and the Royal Society of Scotland, hearing about this, wanted the actual manuscript to be scrutinised by the register of Scotland but the father of the brothers, who had the manuscript, refused to allow it to be seen at all. Even without the evidence of the manuscript, all the rumours about it and the ancestry of the brothers were rife. In 1842 the brothers pop up again but now openly claiming to be the grandsons of Bonnie Prince Charlie and were going by the names of John Sobieski Stuart and Charles Sobieski Stuart giving Versailles as their birthplace. The name they were now using, Sobieski, was Prince Charles mothers family name. They claimed that Prince Charles and his wife Princess Louise of Stolberg had had a secret child who was whisked away and brought up by an admiral by the name O’Halleron, although later it is Admiral Hay and Admiral Allen. This could almost be a plot from a Sir Walter Scott novel. Now given that this was at a time when the British government would be sure to be keeping a close eye on the family, any child, especially a male heir, born to the Stuart dynasty would have been explosive for Britain. They would give no decent explanation as to why a legitimate heir to the throne was kept secret and sent away and then, why, after the death of Prince Charles in 1773 everything, including all titles, was left to his illegitimate daughter and not to this legitimate son and heir apparently living in Great Britain. Even so these were intelligent, charming and good looking fellows who with their stories of their ancestry and their fancies they could sell stings to midges. The main thing though was that the sentiments of jacobite loyalty were still lingering and of course we had the romantic literature of the day. These two men had the nobility of Scotland eating out of their hands. So much so that the nobility would give them free range of Highland estates and lodges to be used at their own disposal. It was now that the subject of the manuscript pops up again, the brothers published 2 volumes of work all about Highland dress and tartans and called it the Vestarium Scoticum of course everything in it all came from the manuscript. 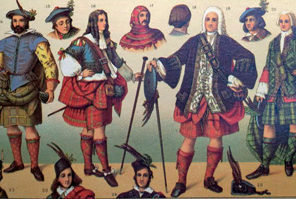 The publications contained 49 Highland clan tartans and 29 Lowland tartans complete with coloured plates. Again Sir Walter Scott and others looked into it and found it ‘doubtful on its authenticity’. 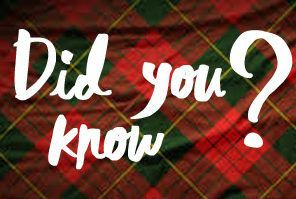 They could find no proof that Highland dress was worn in the south of Scotland at any period of time. They also noted the language used was ‘very imperfectly done’ as certain words would not have been written as such in the 16th century. 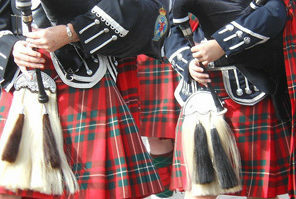 They also noted that there was inaccuracies in the colouring of some of the tartans shown on the plates. Of the 49 Highland tartans in the Vestarium Scoticum only 6 are said to be correct. Several are right in design but the colours are wrong, showing evidence of patterns being done in artificial light ie green as blue and vice versa. We also find that some of the tartans have also been carelessly done, as if the patterns are from memory, but whose? The most obvious ones come from the mind of John Sobieski Stuart. They have the same simple box designs only using different colours. 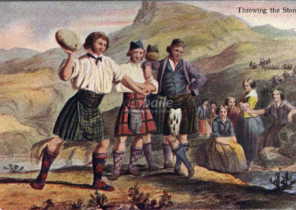 However, as I’ve mentioned before they were very popular gents who would wear quite extravagant Highland dress and were quite the dandys, this was presumably to help their cause, or marketing as we would call it today. Its no wonder that most people would have wanted to believe it. There’s no doubt there could have been some clan tartans out there. That had been commissioned from chieftains to be woven and the thread counts kept within the family, although it is highly unlikely these were saved from the times before 1746 when the act of proscription was introduced. As anything tartan related could bring dire consequences to the family involved. In saying that there may have been old family portraits and the tartan taken from them, or pieces of cloth found and copied. 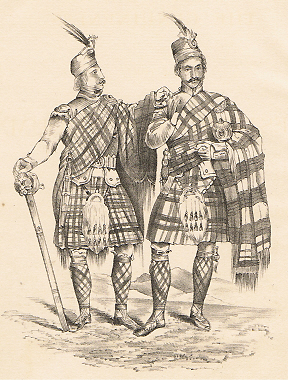 Then there was the tartan rush of 1822, this is when a lot of the tartans were designed specifically for clans, or the chieftain just picked out a pretty one. All so they could attend sir Walter Scotts events put on for King George IV. Even the King had a tartan outfit made. However, it was the brothers who were out there ‘working it’ and convincing the nobility of the day that they had their own individual tartans and that along with Sir Walter Scotts magnificent tartan spectacle is what has stood the test of time. 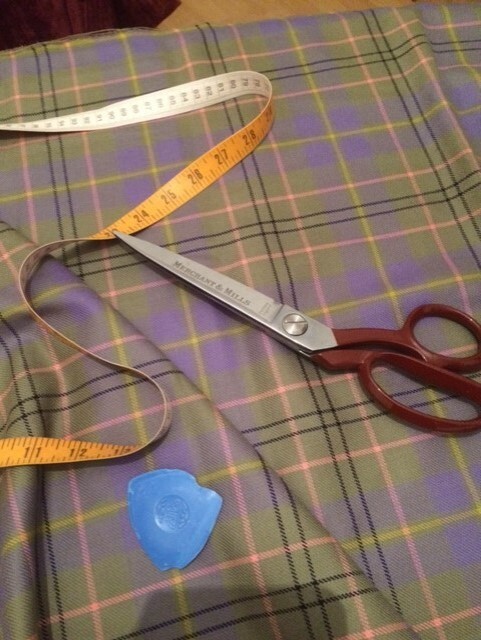 We are still using some of the Vestarium Scoticum tartans as family tartans today. I’ll not tell you which ones though. In 1847 the brothers fell from grace after an anonymous and damming article about their claims to be of Royal blood and their publication of the Vestarium Scoticum in the ‘Quartley Review’, this was a popular English journal of the time. Their reputations were well and truly destroyed. In 1848 John did write a reply to the Quartley Review however, by then it was too late and the damage had been done. They were coerced to leave Scotland and went to the continent to live with relations. I’m sure if the brothers could see the Kilt and Tartan industry today it would bring a wee smile to their faces.